The Norman’s front yard features short stack walls for slope and planting areas with a permeable flagstone patio. The backyard backs up to open space with a seasonal creek and preserve. The 2003 Cedar Fire roared down Mt. Simon and exploded along creek line and some of the property. 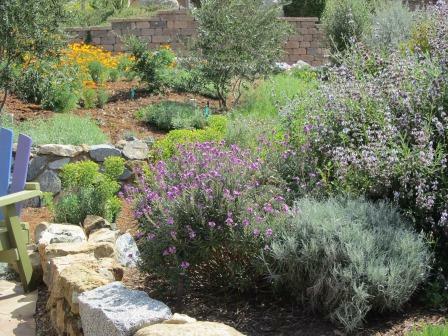 What was once a truly CA native has changed a bit with more hardscape and succulents, as well as edible plants. However, you will see a strong emphasis of natives for the bones of the property. 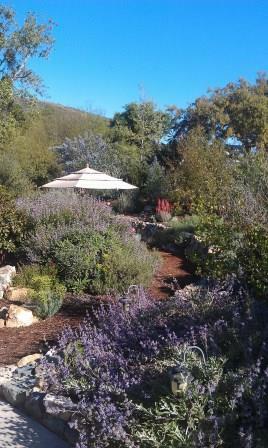 Many of the native plants were planted by Greg Rubin of California’s Own Native Landscape Design, especially the north side and creek side of property with oaks, sycamore, gooseberry, currants, toyons, lemonade berry and the homeowner’s favorites- many varieties of Ceanothus, manzanitas, coffeeberry, Snowberry, Mt. Mahogany, and Flannel Bush. The north side yard contains Bob's cactus/desert garden. It was to be the only place for such plants, but you will see he has sneaked them into other areas too. So our property truly is a blending of both our passionate gardening efforts, sometimes with tension, but incorporating what we are learning from the SD Hort and also from seeing beautiful gardens on our many garden travel trips.